Kathy Johannemann’s results speak for themselves. She has been a multi-million dollar producer every year since becoming a licensed agent in 1996. A consistent top performer, her success can be attributed to her knowledge of the current market at any given time AND to the strong relationships she forms with her clients. 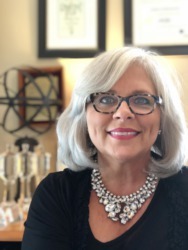 Kathy became a licensed broker in 2004, and is also a graduate of Southridge High School, Tri-State Beauty College and the Gemological Institute. As an ordained minister, she also performs wedding ceremonies! In her spare time, she loves to volunteer for TRI-CAP and spend time with her family. She and her husband, David, have 3 children, 3 grandchildren, 2 dogs, 9 barn cats, 14 chickens and 1 rooster. She also enjoys traveling, antiquing, reading, visiting museums and art shows, motorcycling, four-wheeling, swimming and kayaking. If you want an adventurous agent who truly cares and one that will treat you like family, Talk To Kathy Johannemann today!